The lockout of the musicians at the Minnesota Orchestra has been epic, lasting more than 15 months and involving some moves by the musicians and the orchestra’s donors to establish an alternative corporation. Is signing this contract going to make things all better? The online nonprofit journalism site MinnPost started speculating this past week that the Minnesota Orchestral Association might be close to a contract with its musicians, who had been locked out for 474 days after rejecting a contract that would have included a 35 percent pay cut. NPQ has covered the grindingly long labor dispute repeatedly over the past year, and of late it was evident that there were a number of deadlines looming, including some that might have an effect on the organization’s lease on its performance space. Additionally, donor support for the musicians was solidifying into proposals not just for a split, but also for an attempt to attach the endowment of the Orchestral Association. A new nonprofit was being formed to act as home to an alternative to the MOA, and the musicians had raised $600,000 on their own. But MinnPost reports on what is perhaps the most telling, albeit subtle, sign that a contract agreement was nigh was that during the intermission in Mozart’s Requiem this past weekend, the musicians, who have been performing on their own, did not make their usual announcement of the lockout from the stage. The now agreed-upon three-year contract will require only a 15 percent pay cut, which means that the compensation at MOA will remain among the top 10 percent of orchestras in the U.S., although there are other compensation-affecting elements of the contract. 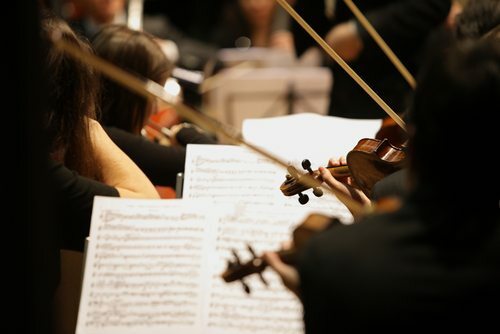 The most interesting part of the contract is a revenue-sharing clause for the musicians, based on the rate of return on the orchestra’s endowments. There have been compromises on both sides, and the contract will likely be a welcome step forward to the community, but there have been many losses in the interim, what with Osmo Vänskä, the MOA’s brilliant music director, and a number of other key players leaving. There are only 77 musicians, instead of the 95 that both sides see as being optimal. Additionally, among those who remain, many, in an attempt to stay solvent, have outstanding commitments to other orchestras.